Dan Handley has always dreamed of educating the layman on science. With a doctorate in genetics from Pitt, he is quite the anomaly in the world of film production. A biotech consultant by day, Handley is more than just a filmmaker. A chain of events in his life sparked both of these interests, leading him to the idea for his first documentary film. “Undaunted: The Forgotten Giants of the Allegheny Observatory” reveals the scientific accomplishments of famous Pittsburgh innovators Samuel Langley and John Brashear. The documentary’s Pittsburgh roots run deep. Local actor David Conrad (who has appeared in “Wedding Crashers” and “CSI Miami”) serves as narrator, and Bill Peduto, a Pittsburgh city councilman, worked alongside Handley as executive producer. The film also features interviews with renowned astrophysicist Neil deGrasse Tyson. In 2000, Handley moved to Pittsburgh upon enrolling in a master’s degree program in logic and computing at Carnegie Mellon University. After noticing the Allegheny Observatory, Handley felt challenged to learn more. However, he had never heard of any observatory in Pittsburgh, and whenever he asked people about the small stone structure with twin domes nestled atop Observatory Hill, the best he got were vague references. Handley did some research online and found out about some of the groundbreaking discoveries that were made in his own backyard. But it wasn’t until he took a tour that he realized the historical richness of the Allegheny Observatory. “Here is something that made contributions to world history, and yet it’s never been publicized,” Handley said. “It was famous 100 years ago, and it’s been lost — the history’s been lost to public consciousness.” Prior to “Undaunted,” no one had covered the Allegheny Observatory in depth. In producing the film, which debuted in April of 2012, Handley has helped the observatory continue its mission of education, research and community outreach. Since May 19, Undaunted has been offered by American Public Television to over 350 public television stations across the country. This has brought great exposure to the observatory, which provides numerous research opportunities for Pitt students. In September, the Carnegie Science Center showed the film for the first time in the Buhl Planetarium. Screenings of the film will occur on the first Saturday of each month at 6 p.m.
Last February, the Science Center brought Handley in for a Cafe Scientifique event, which included a screening of the movie and a follow-up Q-and-A session. According to Robert Marshall, program development coordinator for the planetarium, that night was the best-attended Café Scientifique event the Science Center has ever seen. “People have called since then asking when it’s going to play again, so we know that the public is generally interested in it. So we wanted to provide a permanent venue for the film,” Marshall said. The present building, known as the Allegheny Observatory, has stood for a hundred years in Riverview Park. Prior to this, the observatory was located on Pittsburgh’s North Side. “The observatory is now more of a museum than a research facility,” said David Turnshek, professor of astrophysics and cosmology at Pitt and the current director of the Observatory. This wasn’t always the case, however. In the ’80s and ’90s, when George Gatewood was director, the observatory was one of the major centers of astrometry: the branch of astronomy that seeks to measure the positions and movements of celestial bodies. This process was abetted by the Thaw Telescope. “In fact, until 1990, [Thaw was] the most successful telescope in the world for measuring distances to nearby stars,” Turnshek said. The Allegheny Observatory was also instrumental in the discovery of exoplanets, or planets that lie just outside the solar system. Pluto is now regarded as an exoplanet. Astrometry isn’t the observatory’s only claim to fame. Handley has also undertaken the daunting duty of exposing the work of a few forgotten giants. In “Undaunted,” he highlights the scientific breakthroughs of two men: Samuel Langley and John Brashear. To a native Pittsburgher, the names Langley and Brashear should be familiar. Two city schools bear the name: Brashear as a high school, Langley now as a grade school and also as a building on Pitt’s campus. It is fairly unlikely, however, that the average Pittsburgher is well-versed in the gigantic contributions these two men have made to science and world history. The Wright Brothers will always be remembered as the fathers of aviation. Wilbur and Orville, however, weren’t the ones to discover the physical rules of mechanical flight and write them down. Langley worked out equations dealing with physical properties of air currents and the power required for flight. Without this groundbreaking work, it would have been impossible to design airplanes. “All [Langley’s] research and his textbook on flight happened at the original observatory here in Pittsburgh,” Handley said. Langley greatly improved the observatory’s capabilities when he became its first academic director in 1867. He installed a small transit telescope that was used to observe the positions of stars as they cross the celestial meridian, or the point in the sky directly above an observer. Using astronomical observations made at the observatory, Langley also devised a new time standard to facilitate coordination on the country’s railroads. This was the beginning of the system of time zones we know today. 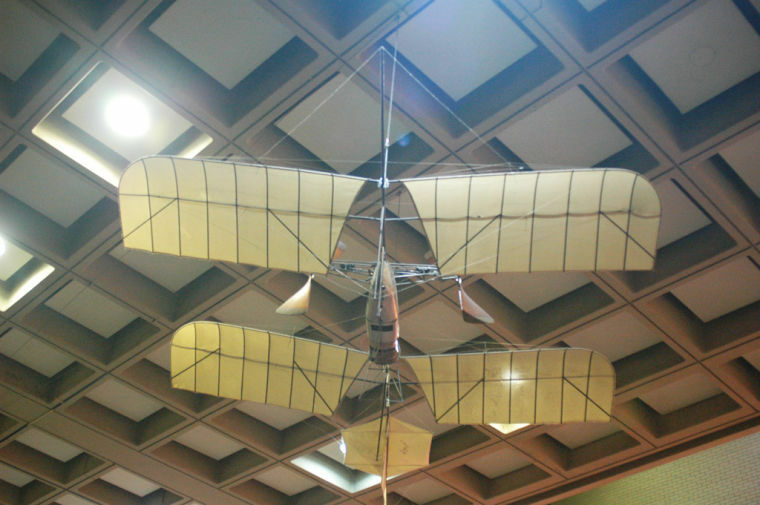 Langley was also one of the first to fly a mechanical flying machine. An air drone he designed is on display in Posvar Hall. “Langley was always thinking scientifically, [inventing] new approaches to things that other people hadn’t thought of before. He did that with astrophysics, and he did that with aviation,” Handley said. Brashear, the second forgotten giant, was indispensable in Einstein’s development of the Theory of Relativity. “If Langley was sort of the genius inventor, or the conceiver of ideas, Brashear was the implementer, the master instrument maker,” Handley said. While working as a millwright in Pittsburgh, Brashear looked for a better way to pursue his love of astronomy at night. Being too poor to purchase a telescope, he built his own workshop, and eventually his own refractor. Several years later, he was working full time designing scientific instruments, including telescopes, a profession that gradually gained him worldwide respect. In 1898, he became director of the observatory, only to leave his post in 1900 to serve as acting chancellor at Western University of Pennsylvania, now known as the University of Pittsburgh. “It’s an inspirational story, in a sense, of someone who just wanted to do something so badly to understand astronomy, that he just did everything himself. But in the process he ended up learning how to be a master instrument maker,” Handley said. In fact, Brashear’s optical instruments were so precise that they were sought after in the famous Michaelson-Morley experiment. The experiment, which is often considered a starting point for the second scientific revolution, attempted to detect the relative motion of matter through “aether wind.” The negative results helped discount the prevalent aether theory and prompted further research that eventually led Einstein to formulate his Theory of Relativity. “Undaunted” is a tribute to these two men, who through sheer determination have changed the world. Truly, these are two men history must never forget. But it is also a tribute to a building – a building now forever immortalized that has seen over a hundred years of scientific triumph.